(RT) — A life-size gold sculpture depicting rapper Kanye West as a crucified Jesus Christ, called “False Idol,” has surfaced in Hollywood. 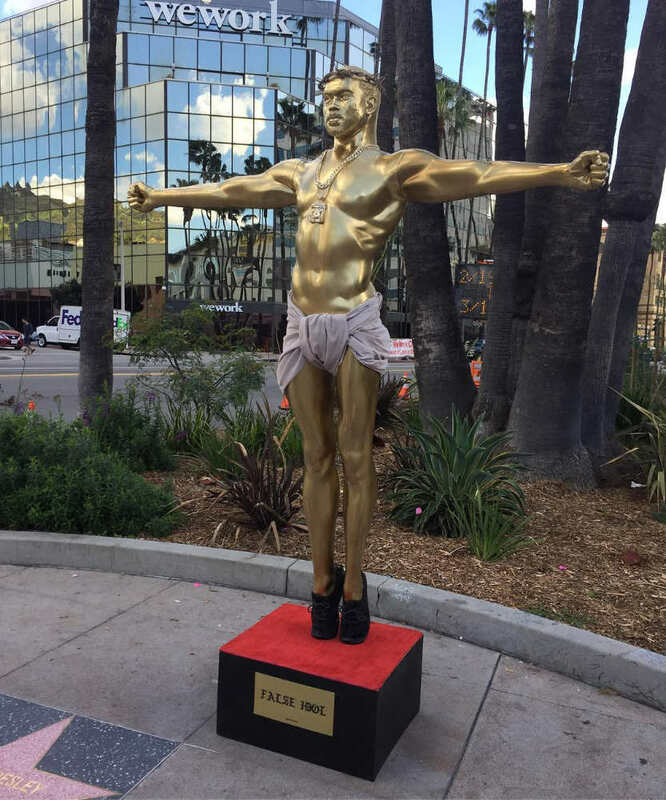 The Oscar-like statue appeared on Hollywood Boulevard on Wednesday and is a representation of the way in which society idolizes celebrities, until they crucify them. “The piece is as critical of us as consumers as it is of Kanye himself,” the street artist behind the creation, ironically named “Plastic Jesus,” told the Hollywood Reporter. While West isn’t nailed to a cross, he’s positioned in the same outstretched stance, wearing a crown of thorns, a simple cloth and, naturally, his Yeezy Boost 350 sneakers from his shoe collection with Adidas.